Catherine Van Rensselaer was the youngest child of Solomon and Arriet Van Rensselaer, and the granddaughter of Philip and Maria, Cherry Hill's original occupants. In 1856, Catherine married Reverend Samuel Bonney, and the couple traveled to China—to Canton and Macao—as missionaries. Under their sponsoring organization, the American Board of Commissioners for Foreign Missions (ABCFM), Catherine served as a “help mate” to her husband—but against their will and independent of their support, she implemented an initiative of her own, opening a school for girls. 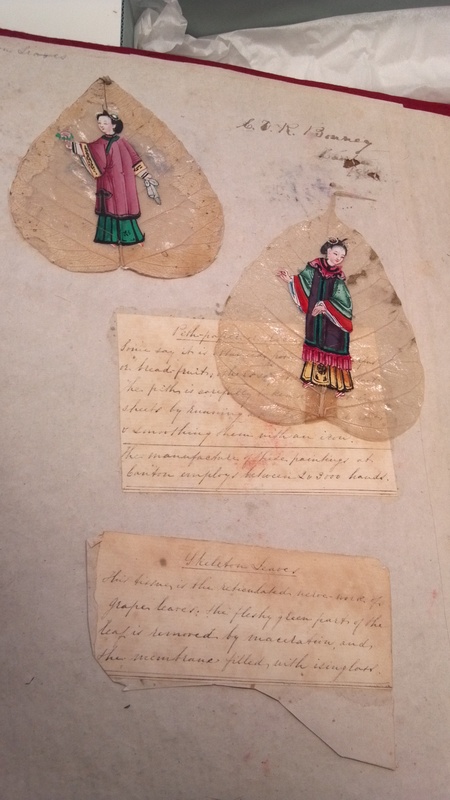 Catherine Bonney's papers and collections reveal a life of devotion to her faith and to her Chinese pupils, an experience of physical hardship and illness, and an attitude of sometimes critical fascination with Chinese culture. In Canton, Catherine found herself in a part of China with a long history of Western presence. European obsession with Chinese goods, such as silk and porcelain, had created a centuries-old booming, if one-sided, trade. The “China trade,” however, was tightly controlled by the Chinese imperial government, and, until the 1840s, all trade was funneled through Canton. As a result, Canton was ever abuzz with Western merchants and ship captains and became one of the world's great shopping centers. Catherine wrote in 1858, “It is here as in New York everything beautiful if you have plenty of money to buy.” Though often bemoaning that she didn't have “plenty of money,” Catherine procured some luxury wares not widely available or widely affordable in the West, and she sometimes acted as a buying agent for her family at home. A woman of refined tastes from an elite family of shrinking means, Catherine availed herself of the fine goods of one of the world's shopping capitals; and these goods were more affordable because she bought them directly. 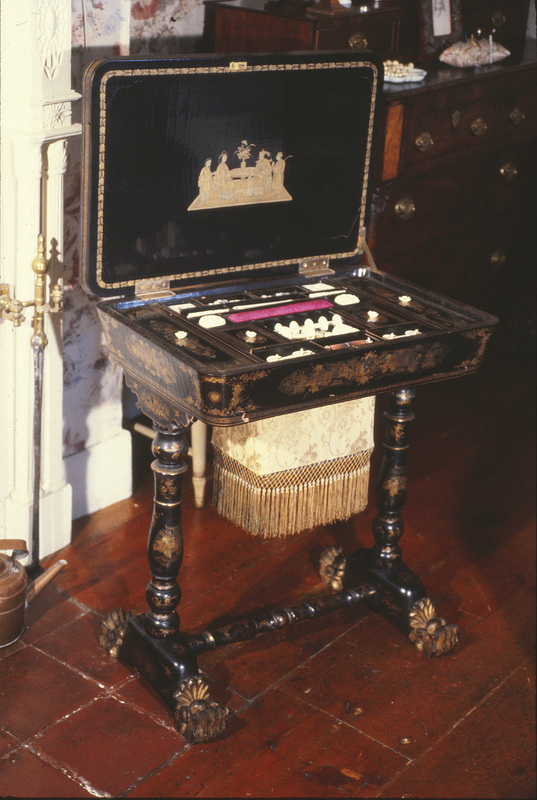 During her missionary years in China, Catherine Bonney purchased this lacquer work table for her niece, Harriet Van Rensselaer Elmendorf (later Gould) (1844-1920). The black lacquer table is covered in gold decoration depicting Chinese people and scenes. The monogram “HVRE” appears on the lid, which lifts to reveal compartments of carved ivory sewing accoutrements. Photographs suggest that this was a prized parlor piece at Cherry Hill. 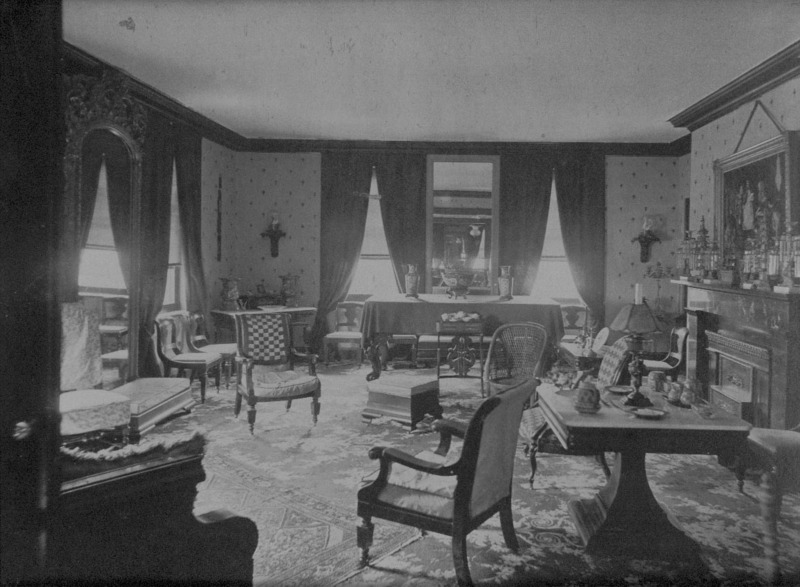 The table appears in an 1882 Elmendorf-era photograph of the house's formal parlor and later in a 1948 Rankin-era photograph of the same room. Catherine Rankin (1858-1948), great-granddaughter of Cherry Hill's original occupants (Philip and Maria Van Rensselaer) and cousin of Harriet Elmendorf Gould, procured the table from her cousin in exchange for $1 and the promise to pay Harriet's rent and support. Catherine's children, Edward Elmendorf Rankin (1885-1961) and Emily Rankin (1889-1963) donated the piece to the Albany Institute of History & Art in 1954. 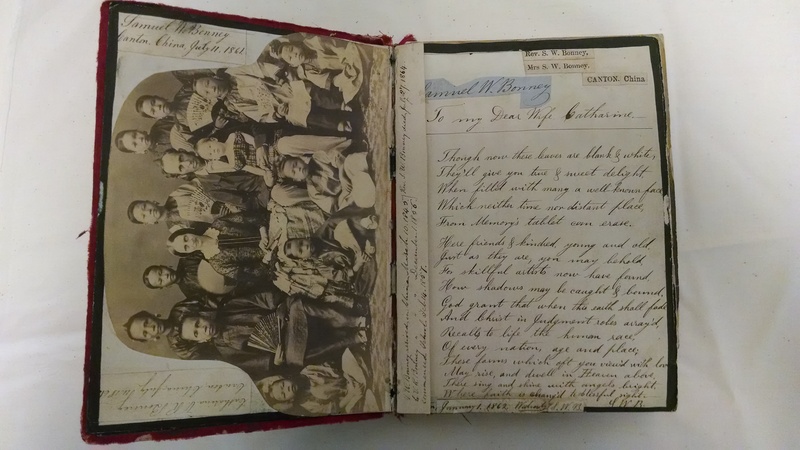 Catherine Bonney records the purchase of a “Punchbowl and stand” for her sister, Harriet Maria Elmendorf (1816-1896) in 1869. 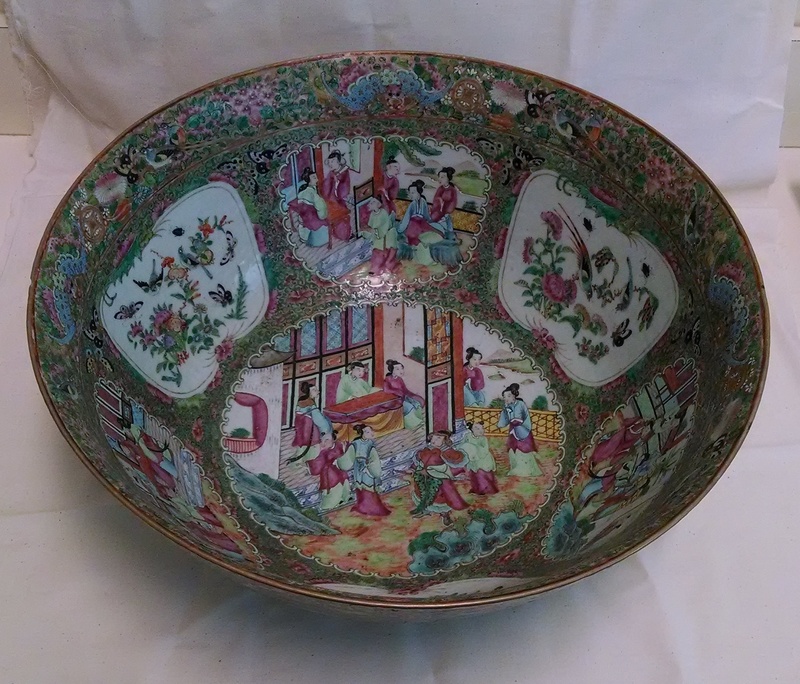 This rose mandarin punchbowl is likely the one referenced. The punch bowl can be seen in an 1882 photograph of Harriet's parlor. 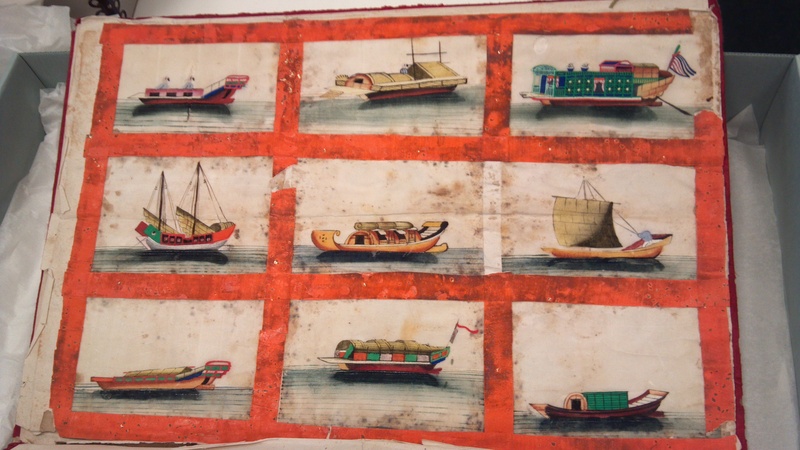 Among Catherine Bonney's souvenirs of China were a number of albums containing watercolors on pith paper (or “rice paper”) and “skeleton leaves.” The watercolor collection includes various depictions of life as observed and experienced in Canton (Guagzhou): native plant life, ships, depictions of crafts and trade, and the grisly “Chinese Punishments.” Bonney appears to have collected the watercolors, pasted them into silk-covered albums, and annotated them with descriptions of how the paintings were made as well as what is depicted. According to one of Catherine's entries, the production of these watercolor paintings employed 2000-3000 people in Canton. According to Catherine's description, a skeleton leaf is made by chewing a grape leaf in order to remove the flesh; the leaf is then filled with isinglass, a jelling agent. 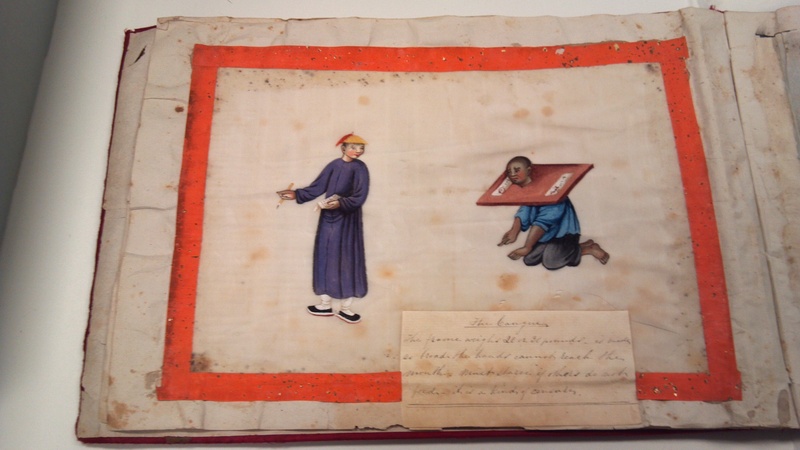 In another annotation, Catherine describes one of the Chinese tortures: a frame weighing 20-30 pounds is placed as a collar around a prisoner's head. The frame is broad enough that the prisoner cannot reach his mouth to feed himself. He will starve if not fed by others. Catherine lived near the execution grounds; perhaps this explains why her collection includes more paintings of "Chinese punishments" than any other subject. 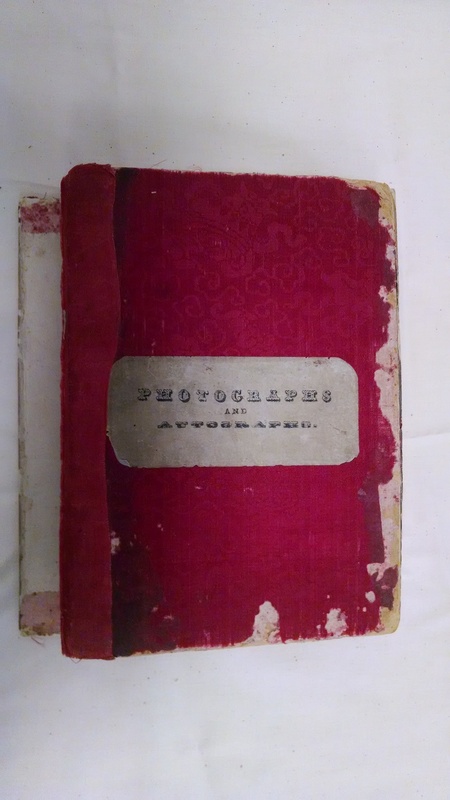 Catherine's husband, Samuel, lovingly gave his wife this silk-covered scrapbook in 1861, inscribing it, “Though now these leaves are blank & white, / They'll give you true and sweet delight / When filled with many a well-known face, / Which neither time nor distant place, / From memory's tablet can erase.” Catherine indeed filled the album with photographs of family, clergy, and fellow missionaries. 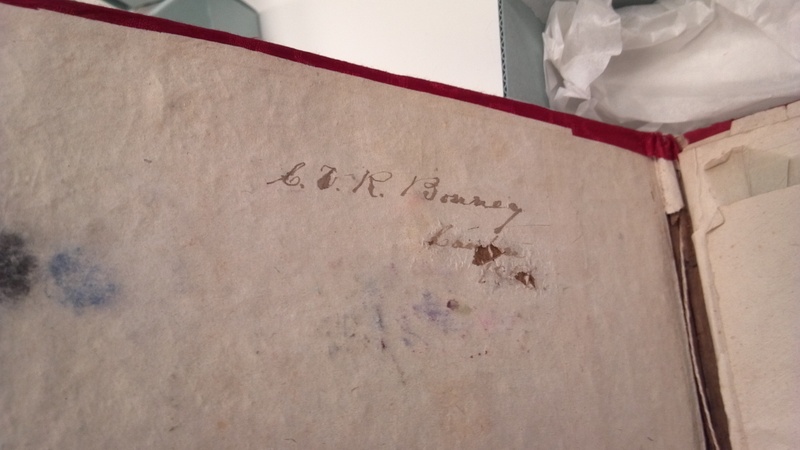 She often appears to have clipped signatures from her letters and pasted the autographs next to their associated photographs. A photograph of her girlhood home, Cherry Hill, is also tucked into the back pages of the scrapbook. 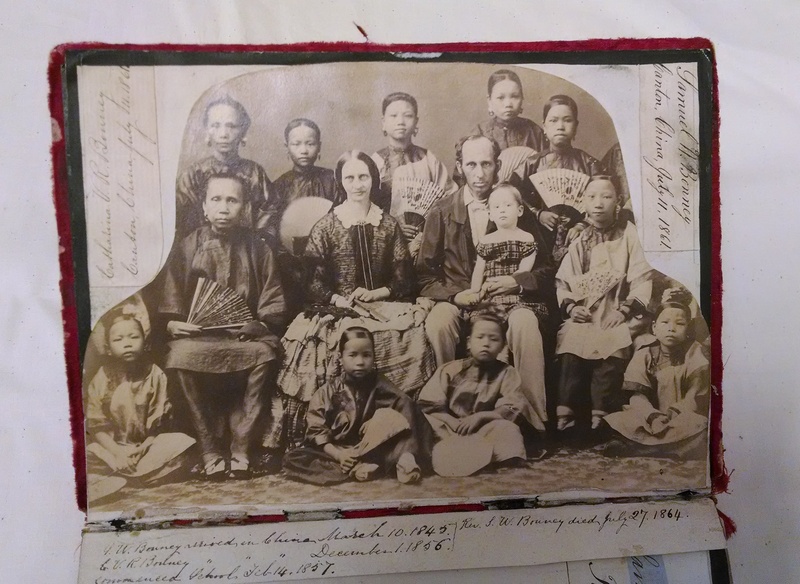 But by far, the most prominent entry is the photograph that opens the book—Catherine Bonney with her husband, Samuel, and her Chinese pupils. 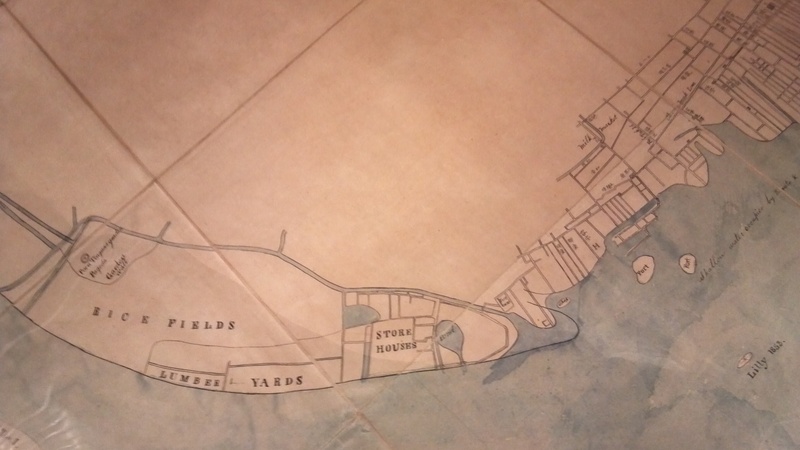 This hand-colored map of Canton shows the city's harbor, parade grounds, buildings, rice fields, pagodas, and asylums. 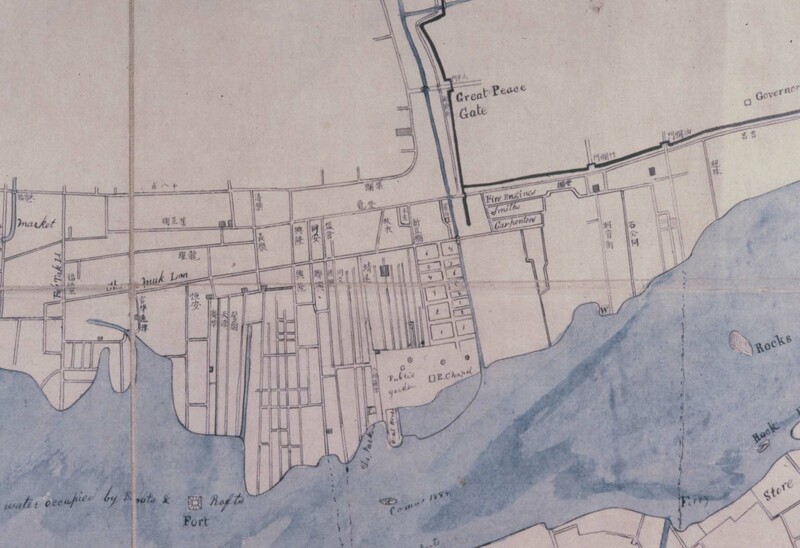 Drawn in 1855, one year before a major fire destroyed the city's foreign quarter, this is one of very few extant maps that represent Canton (now Guagzhou) as it appeared before the fire. It is attributed to Rev. Daniel Vrooman, a member of the American Board of Commissioners for Foreign Missions, who was stationed at Canton and was a fellow missionary with Catherine and Samuel Bonney. Manuscript research, however, suggests that the map was most likely drawn by Vrooman's Chinese cook.